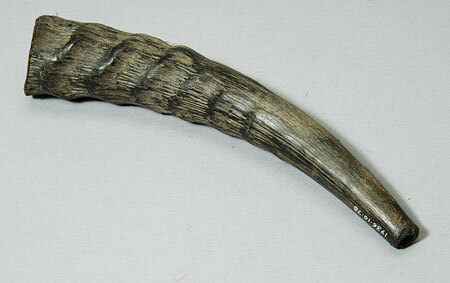 Small side-blown trumpet, carved out from a piece of antelope horn and hollowed out. This has been cut flat at the proximal end to form a circular finger-hole that shows some wear and is slightly damaged; the body tapers out from this point and becomes more oval in section, curving to follow the natural shape of the horn. Two large holes have been cut into the upper, convex surface. The largest of these is positioned 80 mm from the proximal end, and is oval with a well rounded edge that shows signs of use-wear. This measures 28 by 16 mm across the top, and 23 by 13 at its actual base opening. The second hole is only 35 mm from the proximal end, and has been more crudely cut with rough edges and a more sub-rectangular shape. This may have been a later addition to the object, possibly an experimental second finger or thumb hole. This measures 20 by 15 mm across the top edges and 15 by 8 mm at its base. The body of the horn continues to expand beyond the embouchure, with natural ribbing that becomes more marked as it approaches the distal end. The bell mouth has been roughly cut and has an undulating edge; a small hole has been bored just below this on one side, perhaps to attach a suspension loop. The upper edge of this has broken. The horn is a dark brown to brownish black colour (Pantone 440C), and is complete and intact, with a weight of 64 grams and a length of 204 mm. The proximal end has a diameter of 13.5 mm and a finger-hole opening of 8 mm; the bell mouth exterior measures 37 by 32 mm, with an internal opening 33 mm long and 27 mm wide. The length from finger-hole to the edge of the embouchure is 80 mm . Collected by E.E. Evans-Pritchard during his fieldwork amongst the Anuak, which took place between early March and May 1935 (E.E. Evans-Pritchard, 1940, The Political System of the Anuak of the Anglo-Egyptian Sudan, p. 3). These trumpets were known as tung, and were used for hunting, signalling, and when escorting persons of high rank. Additional accession book entry [p. 415] - 1936.10.78 Number given HLR. L[ength] 20 cms. Old Pitt Rivers Museum label - Tung , kob's horn trumpet (hunting and signalling). ANUAK, E. SUDAN. d.d. E. Evans-Pritchard 1936 [rectangular metal-edged tag, tied to object; RTS 2/12/2004]. Sparks, Rachael. "Anuak trumpet" Southern Sudan Project (in development). 03 Jan. 2006. Pitt Rivers Museum. <http://southernsudan.prm.ox.ac.uk/details/1936.10.78/>.